Different people have different ways of relaxing. Some enjoy a round of golf. Others enjoy luxuriating and being pampered with spa treatments. But there's one thing that both types have in common: Both can save on these favorite pastimes with a handy rebate program. 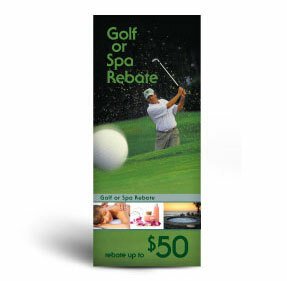 This rebate can be used for one round of golf or one spa treatment (manicure, pedicure, facial, massage) at most golf courses and spa facilities in the United States and Canada. This certificate can garner a single rebate up to $50, based on the amount spent – as indicated by the total of the submitted receipt. Simply complete and send in your certificate to register. You'll receive a rebate voucher to complete and return, along with your original receipt. Our design and print services make it easy to order and start using for your business right away. Communication and registration for all of our rebate programs is handled by mail. Our fulfillment center works diligently to process all rebate claims and quickly issue rebate checks. All you need to do is fill out and return your registration card. When you receive your rebate voucher, complete and submit it to International Rebates, along with your original receipt. Please allow 8-10 weeks for processing of rebate checks.